The life of the French sculptor Camille Claudel is a tangle of art, passion, madness and betrayal. A student and lover of Rodin’s, Claudel was a critically acclaimed artist when she began to show signs of mental distress, which led her family to commit her to an institution, where she spent the remaining 30 years of her life. 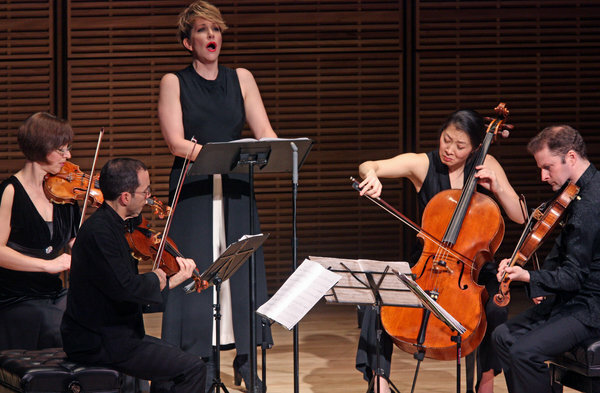 On Thursday at Zankel Hall, the incandescent mezzo-soprano Joyce DiDonato presented the New York premiere of Jake Heggie’s “Camille Claudel: Into the Fire.” Set for voice and string quartet, the work compresses a tragic life of operatic dimensions into a song cycle of great beauty and emotional resonance. Ms. DiDonato is one of this season’s artists in the Perspectives series at Carnegie Hall, tasked with assembling a group of concerts that reflect her own interests. At first glance, these seem eclectic: Thursday’s program, which featured the fiercely eloquent Brentano String Quartet, also included instrumental music by Charpentier and Debussy, as well as the world premiere of “Mother Songs,” a set of lullabies composed by amateurs, resulting from an outreach program of Carnegie Hall’s Weill Music Institute. But at a closer glance, there was a narrative cohesion to the concert that revealed Ms. DiDonato’s intelligence as a storyteller. Debussy’s seething String Quartet provided a backdrop for Claudel’s personal drama, a Parisian arts scene humming with innovation yet anchored in the kind of classicism of which Charpentier’s “Concert Pour Quatre Parties de Violes” is an elegant example. The Brentano Quartet performed both with stylistic finesse; in the Debussy, the juxtaposition of blurry textures and bright explosions of sound vividly evoked Impressionist painting. The touching simplicity of “Mother Songs,” written in a gospel-tinged American vernacular, with spun-sugar arrangements by the composer Luna Pearl Woolf, may seem far removed from Claudel’s wild genius. But the authors, women who had teamed up with teaching artists from the Weill Music Institute during their pregnancies, drafted these lullabies facing their own struggles. Of the four women represented in Ms. DiDonato’s performance, one had been homeless during her pregnancy, two were teenagers, and one was incarcerated on Rikers Island. Ms. DiDonato’s tender performance of their songs alongside her tribute to Claudel thus became a gesture of defiant compassion. Reblogged this on Oxingale Music.